Here in Minnesnowda we are just wrapping up one of the coldest winters in recent memory. As much of the world commemorates Earth Day, today April 22, 2014, I could not help but think back to less than one week ago to an overnight snowfall here. Lady, our shop dog, and I were spared the 10" of snow that fell about 1/2 hour north of here, but still had our hopes of spring dashed with a fresh covering of the white stuff as shown in the photos below. And the (not so) good news? The weather prognosticators say we may get a repeat next week! "...but I thought you said spring was here..."
Seriously folks. We had one month this winter that our heating bill was north of $1500 while the thermostats were set so low that it remained long-johns and sweatshirt weather inside both the house and the shop. My wife's legs were nearly crushed from the weight of extra blankets on our bed all winter. I like to call this one "The Three Stooges"
The photo above caught my eye first. 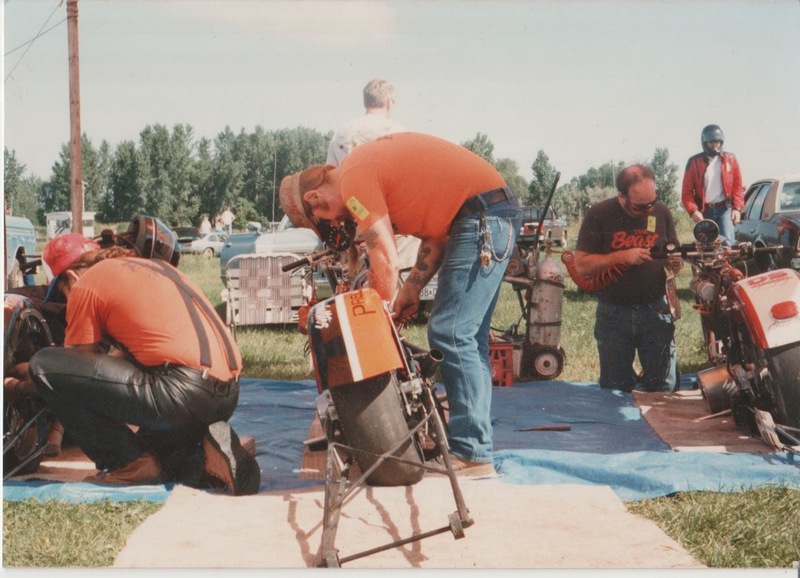 Obviously taken before we became savvy enough to build stands to hold the drag bikes up off the ground high enough to save on the back. But then, we were all young then and likely did not notice. On the left is Uncle Aard hard at work on his Shovelhead. Yours truly is in the middle attending to the Pro Stock Knucklehead and Neil Ryan on the right is probably chasing down leaks in his Shovelhead's air shifter. My guess is that the picture is from 1989. If so, that was the second year for the PMFR chassis with 8-1/2" slick on the dual carb Knuckle. Neil also ran a PMFR chassis on his Shovel; the first one ever built for a Harley (mine was the second). Neil's sported a 10" slick which he put to good use behind the 114" Shovel. This picture may very well have been taken the weekend that Aard first put a 7" slick on his Shovel, promptly breaking the front motor mounts off his crankcases. Nothing like the tire really hooking up to stress test everything else in the drive train! Below is a series of photos from the early 1990's. The dual carb Pro Stock Knuck had been replaced by a 120" Knuckle with a centrifugal supercharger in a lay down Top Gas chassis with 10" slick. That's Dangerous Dan, our long time crewman (in black with red bandanna) enjoying the view ...well, at least for a moment. I am pretty sure that is Aard piloting the bike, since he always wore a dark colored helmet and mine was white. It was probably taken at the Sturgis race.